As the daughter of an architect and a scholar, I spent many summer days on cultural excursions with my family to the Parthenon in Greece, the Pyramids in Egypt, and the Persepolis in Iran. In my career as a journalist in public media for 25 years, I designed stories anchored in multiculturalism. In 2015, my last position at NPR News was senior producer of the Identity and Culture Unit. Looking ahead, I see a gaping hole in the emerging tools that will train future storytellers — the lack of prolific cultural content in Artificial intelligence (AI) algorithms. It was this past summer when I got hooked to AI. Across six courts at Wimbledon, it was AI-powered IBM Watson, working with the All England Lawn Tennis Club, that analyzed and curated the best moments from the matches, producing “cognitive highlight” videos and sharing the content with global fans. The speed, scale, and accuracy of the machine-curated content was mind-boggling and only possible because for 22 years Watson has been analyzing an estimated 53,713,514 tennis data points. With a team of journalists, (including my former NPR colleagues Robert and Kee Malesky) educators, and machine learning experts, we have just formed IVOW, to research and develop automated, intelligent stories based in world culture and tradition — tagged through citizen engagement and strategic partnerships. This means we’ll apply algorithms to leverage data for smart and culturally rich stories. IVOW stands for Voices of Wisdom and also a vow to design the next generation of intelligent machines to be culturally conscious. Over the past few years the AI community has been mining vast amounts of data and leveraging algorithms in an effort to foster innovation in self-driving cars, cybersecurity, healthcare applications, and facial recognition. IVOW is focusing on the same science for future AI consumer storytelling applications — a virtually untapped market. Meaningful automated stories of the future will only come about if we diversify available data now, and we’re building a dynamic team at IVOW to do this. 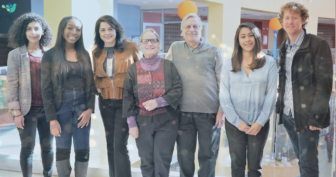 In one of our first company huddles, we shared heritage stories from our African-American, Afro-Caribbean, Native American (Cherokee, Seminole), European, Mexican, Irish, Polish, Indian, and Iranian ancestries. Simin Kargar talked about how popular Google’s Art and Museum app doesn’t seem to be able to find a racially appropriate painting to match some of our selfies — one of the many reasons we need more diversity in AI. Kargar is affiliated with the Harvard Berkman Center for Internet and Society and is IVOW’s Director of Strategic Initiatives. Effective fusion of AI, culture, and storytelling will help diminish bias in algorithmic identification and train AI software to be much more inclusive. Several groundbreaking works on AI, culture, and storytelling by current or former MIT researchers prove that such an endeavor is possible and critical, including the works of Joy Buolamwini leading Gender Shades, Wolfgang Victor Hayden Yarlott’s Old Man Coyote Stories, Rafael Pérez y Pérez’s MEXICA project, and D. Fox Harrell’s imagination, computation and expression laboratory. Until recently, I led the storytelling division at the open innovation agency SecondMuse and worked across the world from the South Pacific to Sweden engaging in global storytelling campaigns and piloting emerging technologies for social good. We researched new ways to connect the dots around social impact stories, including engaging with Palo Alto’s Institute For The Future and IBM’s AI for Social Good on healthy eating solutions in the South Pacific, where nine of the ten nations suffer from obesity. I was blessed this past winter, when SecondMuse encouraged me to branch off, take the entrepreneurial plunge, and start my own AI-focused storytelling agency. Simin Kargar, Davar Ardalan and Ben Kreimer speaking at MIT Media Lab and Harvard Berkman Center for Internet and Society’s AI Community in February 2018. “It’s a privilege to support this project that will bring data to the art of storytelling and socially-aware journalism,” says IVOW’s Director of Research Kee Malesky, a veteran public radio journalist who was NPR’s longest-serving librarian. On April 23, 2018, we will co-host the “AI for Social Good Symposium” in Baltimore together with Morgan State University. AI thought-leaders, journalists, and cultural experts will gather to discuss frameworks for citizen and machine as we begin incorporating AI, humanities and the social context. 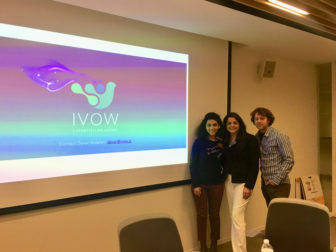 “What excites us about IVOW is their mission to build a coalition of like-minded organizations to come together to build a crowdsourced platform to involve the public in this endeavor,” says Dr. Farin Kamangar, Associate Dean of Morgan State University School of Computer, Mathematical and Natural Sciences. Davar Ardalan is the founder and storyteller-in-chief of IVOW with extensive expertise in social engagement and new technologies. Most recently Ardalan was the Director of Storytelling and Engagement at SecondMuse where she lead immersive storytelling projects in the Indo-Pacific. As an award-winning journalist for over two decades at NPR News in Washington D.C., her real-time storytelling campaigns cultivated thought leaders across social media. Ardalan co-chairs the Stories and Audiences Committee of the VR/AR Association, and has been recognized with a 2017 NASA Team Leadership award for Space Apps; a Gracie Award from the American Women in Radio and Television; and a shout-out in the popular comic strip Zippy. In May 2014, she was the recipient of an United States Ellis Island Medal of Honor, for individual achievement and for promoting cultural unity.